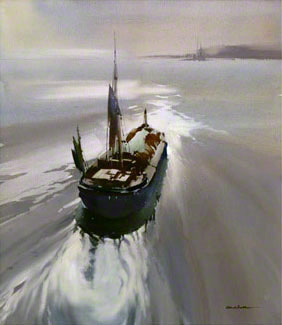 Claude Buckle was a true marine artist and this picture of a Humber Keel Barge is a typical example of a boat and water scene in the water colour medium. Claude Buckle painted many pictures of boats on water including other pictures of barges. The picture illustrates the artist's technique of showing the forward movement of the boat through water. The wash and wake ripples are shown and balanced by sunlight reflection on the sea in front of the boat. Created in 1973.